At Tile Pro Depot we carry premixed tile grout. 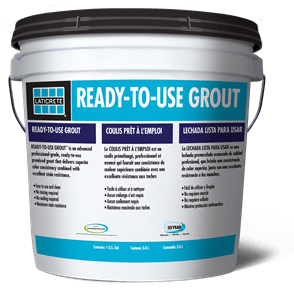 Ready mixed grout is perfect for contractors with any level of experience, and is great for those looking to save themselves some time during an installation. This is because premixed grout does not require any mixing and can be applied straight out of the pail. The Laticrete PLASMA Ready to Use Grout we carry at Tile Pro Depot is formulated with professional grade urethane. It also boasts exceptional stain resistance and eliminates the need for sealing. It has a great early strength and possesses a flexible workability. This ready mixed grout inhibits the growth of mold and mildew in grout joints, which can cause stains. It is tough, durable, and crack resistant, and is a non-sag formula perfect for floors and walls. At Tile Pro Depot we offer over 20 colors of premixed grout, including a translucent option. The translucent premixed tile grout is comprised of glass beads suspended in a translucent binder, and is ideal for glass tiles, as it allows light to pass through and reflects the color of the surrounding tiles. Our wide range of premixed grout colors offers endless possibilities when it comes to your design choices. When you’re considering purchasing premixed grout for your next tile installation, Tile Pro Depot has everything you need. We have a variety of premixed grouts, as well as a large assortment of epoxy and cement based grouts. We also carry a number of tile installation tools to help you complete the job from start to finish, like trowels, sponges, tile cutters, grout floats, and tile spacers. No matter your grout needs, Tile Pro Depot has got you covered. We’re you’re one stop shop for tile installation. Buy premixed tile grout at Tile Pro Depot – doesn’t require any mixing or shaking. Get your ready-to-use tile grout from Tile Pro Depot.